Flem is a cute, but challenging 2D retro-platformer with a speed run focus. Run and jump through four seasons as the lost snot ball Flem and help him find his people after the calamity of the Great Sneeze. Complete levels as fast as you can to earn medals and compete with other players through leaderboards. Later levels introduce new abilities, like turning into a floating cloud, adding a new dimension and flow to the gameplay and speed running. Simple, but challenging 2D platforming. Time trials for every level and leaderboards for comparing times with other players. Colorful pixel-art depicting the four seasons, and an upbeat retro soundtrack. Flem is out now on PSM! A few days ago, we passed Sony’s review of the Vita build for Flem. 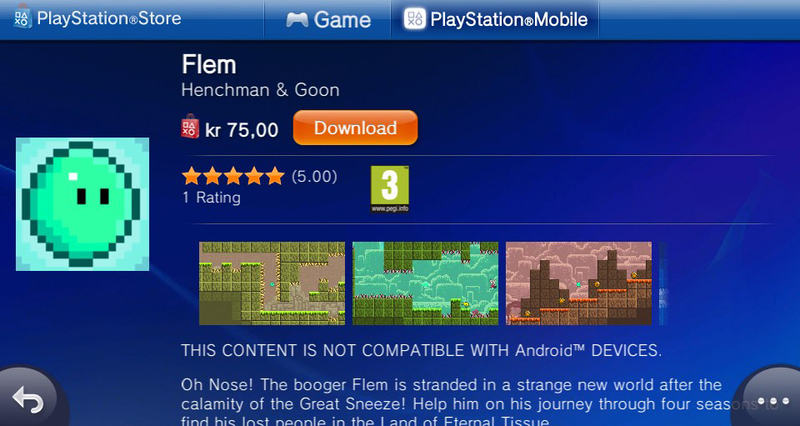 Today, we were surprised to see, but happy to announce that Flem has hit the PlayStation®Store under PlayStation®Mobile and is ready for you to buy. So go buy it, and tell your friends!We’re working on the Steam version as we speak, which means you’ll soon be able to buy Flem for PC and Mac as well. Stay tuned for that! The booger ball Flem is stranded in a strange new world after the calamity of the Great Sneeze. Shaken and alone, but unafraid, he sets out on a journey to find his lost people in the Land Of Eternal Tissue. Run and jump through four seasons while avoiding the hostile environment and discover Flem's hidden snot powers, including the ability to turn himself into a cloud. Earn medals based on your best time through each level and compete with other players through leaderboards. Are you gonna go for gold or just try to stay alive? 40 levels over four seasons to run, jump, dash and fly through. Time trials, medals and leaderboards for every level. The development on Flem is in the final stretch and we’re getting ready and eager to finally get the game out to you!